Characterizing the demolition of 99% of a structure as a “renovation” and a ” facelift” is akin to terming the practice of slavery as merely a civil rights violation. The architectural rendering provided for Scheme 6 depicts the extent of the “facelift” that is currently on the table. The four little black boxes you see will be all that is left following the stadium’s “renovation”. All of the light blue - which is the stadium itself – goes to the landfill. This entry was posted in Aycock Neighborhood, Greensboro Politics, War Memorial Stadium. Bookmark the permalink. Both comments and trackbacks are currently closed. Is the full proposal available in electronic form? If it is something the city gov’t is going to do, couldn’t it be made available? There is no actual proposal yet Jim. 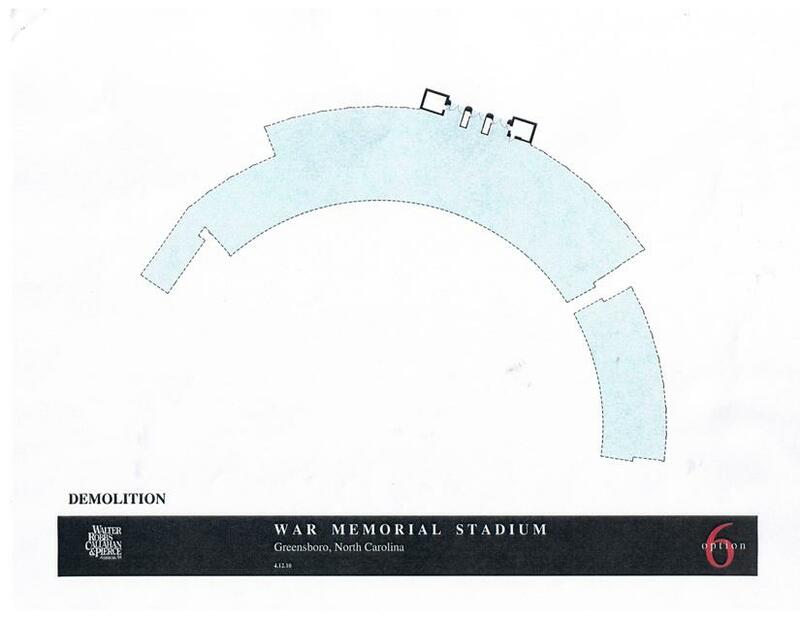 Only the renderings are available which have now all been posted here. City Council and everyone else is digesting it as you are. Scheme 6 reminds me of a spaghetti Western set. You’re right on target. This historic site needs some group to step up and preserve it. I think we’ll regret what’s about to happen. Have you posted renderings for options other than #6? Just trying to have a point of comparison.